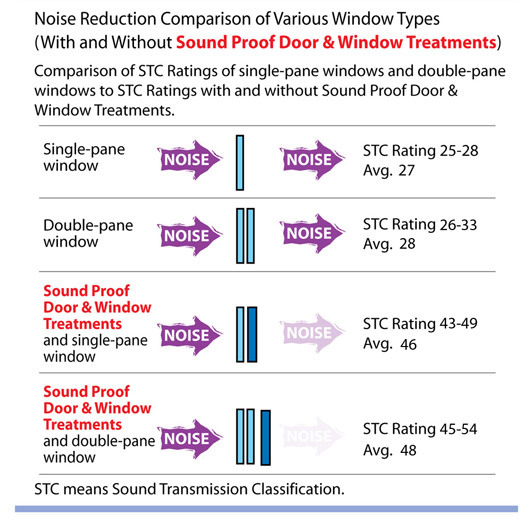 Sound Proof Doors & Window Treatments don’t just effectively improve Noise Reduction. They also improve the interior environment and quality of your home and work environments by protecting your health, your furnishings and equipment, and your peace of mind. Noise reducing windows have surprising benefits besides making your home quieter. Sound Proof Door & Window Treatments provide up to 95% soundproofing. Enjoy the reduction of every imaginable exterior noise and a peaceful, stress-free interior. Cut your window heating/cooling by up to 50% and even more. Sound Proof Door & Window Treatments achieve these amazing figures by preventing the infiltration of outside air. Interior temperatures and humidity levels remain constant, controllable, and comfortable, which saves you money! With everyone trying to reduce energy consumption and costs, noise proof windows provide a cost-effective result. You will experience less draft and humidity. Eliminate 99% of drafts, dust, and pollen entering through your windows. Your indoor air quality instantly and dramatically improves, enhancing your health and the lifespan of your electronic equipment, furniture, and valuables. Sound Proof Door & Window Treatments provide a three-ply second protective layer consisting of hardened and toughened laminated plate glass. The result is safer windows and doors that are shatterproof and burglar-resistant. Noise reduction windows help you to feel more secure. Everything in your interiors – from your carpets to your artwork – is subject to fading and damage from the sun. UV rays are also responsible for nearly all instances of skin cancer. Our standard three-ply laminated plate glass blocks 99% of these harmful rays, and dramatically reduces the risk of skin cancer while preventing costly and unattractive color fading. Using sound reducing windows helps you to protect your furnishings investment and retain a good look for a long time.